Rocket or 'Rocky' as we call him is also here for backing and schooling. He is a young Freisian and has a very friendly/relaxed nature. He is a local from Stillbay and needs a lot of TLC. 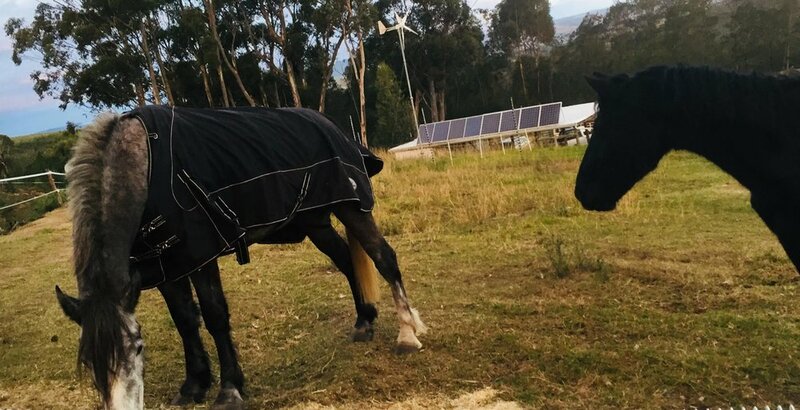 We support all our clients horses with full livery for their horses and social interaction with our herd outside (interaction with a electrified camp between them for safety of course*). They are groomed twice a day, fed twice a day, temperature checks, night checks, farrier service (if required and granted), dental and full veterinary service available (their is a equine hospital in Riversdale should any horse require medical attention or hospitalization). Quality feed is given to all the horses or clients can supply us with their horses dietary requirements. Ibalansi's 'classroom' is a big custom made 60x40m sand arena where we train, communicate and school your horse/s and our own on a daily basis. We want to give all our guest horses a full 5 star treatment when they visit our farm. Our mission is simply to ensure your horse is comfortable and enjoys his/her schooling and stay at Ibalansi.